When Tales of the Spiral was in its infancy, I didn't really know anyone in the community. All it took was me hitting 100 posts, throwing a party and because of this, a never-ending friendship was born. Back in the days of fansites being found at "________.blogspot.com", I had reached a milestone I didn't think I would ever hit. 100 blog posts. Wow... That's a lot. At that time I was putting out a few posts per day. Granted they weren't the most thought out but then again, I was also 13. You guys might not always take me seriously when I say I love throwing in-game parties but I've been doing it for nearly 7 years now! 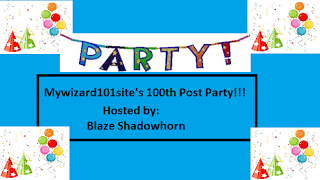 Upon hitting 100 posts, I decided to throw the 'Mywizard101site's (yes... that was the original name of Tales of the Spiral) 100th Post Party! I didn't know who would show up, I just figured I wanted to celebrate this momentous occasion... And then it happened. You have probably heard the name Edward Lifegem tossed around once or twice... or three or four because over the years he's become quite the big deal within the Wizard101 community. One of the first Wizards to show up to this party was Ed. At the time, I might have known of Ed's blog (I think I did) and we were kind of in the same boat. We started talking and he told me how he started his blog just a few months before mine. We added each other in game, followed one another's blogs and exchanged emails (yes, email used to be the communities main form of contact lol). This May will be marking six years that I have known Ed and honestly it's crazy to see where we once were and where we are today. Ed was my first friend in the Wizard101 community and we've thrown everything from crazy parties to dungeon runs, meetups and moreover the years. We have both surpassed the diaper days of "________.blogspot.com" and have moved on to fancy new domains such as www.edwardlifegem.com. If you didn't get the hint, that's Ed's blog and you should kind of, sort of, maybe check it out and drop him a follow. He puts up some great content that I think you all might enjoy. And that young Wizards is how I met my first friend in the Wizard101 community. Who was your first friend you made in the community? How did you meet? Leave a comment below telling me all about it and make sure to share this post with your friends so they can see it as well! With that folks, I'll see you tomorrow for Day 4 of Seven Days to KI.